The basal crop coefficient, Kcb [see Eq. (5.53)] is defined as the ratio of ETc/ET0 when the soil surface is dry but transpiration is occurring at a potential rate (e.g., water is not limiting transpiration) [2, 71]. Therefore, Kcb represents primarily the transpiration component of ET. 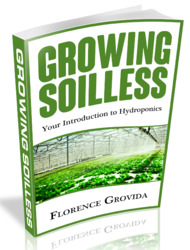 Its use provides for separate and special adjustment for wet soil evaporation immediately following specific rain or irrigation events. This results in more accurate estimates of ETc when it must be computed on a daily basis. Recommended values for Kcb are listed by Allen et al. [91, 95] but they can be obtained from Kc in Table 5.1 using the procedures indicated below. Kcb during the initial period, denoted as Kcbini, is estimated for annual crops by assuming that a constant value can be used to represent evaporation from a mostly dry and bare surface soil layer that may occur during the initial period (see [2, 71, 92, 100]). For perennial crops having a nearly bare soil surface at the beginning of the growing period before the initiation of new leaves, Kcbini can be estimated as 0.15 to 0.20.
the second being recommended when crops are routinely irrigated frequently. for C < ~0.8, where C is the average fraction of soil surface covered (or shaded) by vegetation (0-0.99). Figure 5.7. 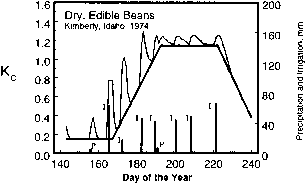 Application of the basal crop coefficient approach to edible beans in Kimberly, Idaho, 1974. Source: J. L. Wright, personal communication. The Kcbmid and Kcbend need to be adjusted for climate using Eq. (5.67). The Kcb for the crop development period and for the late-season period are obtained by linear interpolation as indicated for the Kc curve (see "The Kc Curve," above). 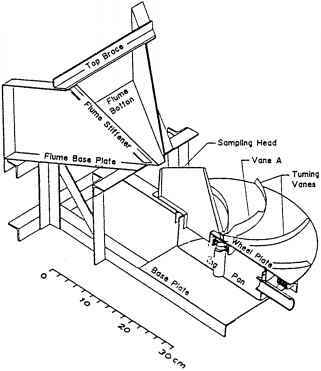 This is illustrated in Fig. 5.7.